Gran Canaria is a Spanish island off of the coast of Morocco, which is the destination of choice for the Tinkoff-Saxo December training camp. The team has been coming here for several years as it ensures consistent weather, a perfect mixture of terrain, and quiet roads. If you haven’t heard of Gran Canaria you may have heard of another island in the Canary Island chain called Tenerife, which is where many of the top World Tour riders choose to do their high-altitude training camps. Teams traditionally organize two separate two-week long training camps. The first is done at the beginning of December, and then second in early January in order to prepare the team for the season which starts in Australia in January. The camps are also a time to organize bike fits, conduct physiological testing and create team camaraderie. The daily routine doesn’t change much within these camps and most teams have similar programs. Breakfast kicks off the day at 8:00AM. The food and coffee is always of high quality and includes a vast array of eggs, ham, cheese, bacon, bread, yogurt, fruit, cereals, and much more. No pancakes here though as there isn’t a lot of “carb loading” as you might expect. Most riders have a balance of protein and carbohydrates and a little fat. It seems more teams are starting to incorporate a morning stretching and core work session to help with injury prevention and economy of movement on the bike. At Tinkoff-Saxo each morning session is led by an Italian personal trainer Riccardo Colucci starting at 9am. Since the weather in Gran Canaria tends to always be pleasant, these sessions are conducted outside and each rider has a yoga mat and stretch band which are used in some of the exercises. At 10:00AM, the riders meet in the parking structure where the bikes are kept and collect bottles and food which includes items from Pro Bar, Etixx, and Secret Training, as well as bananas and small pastries. 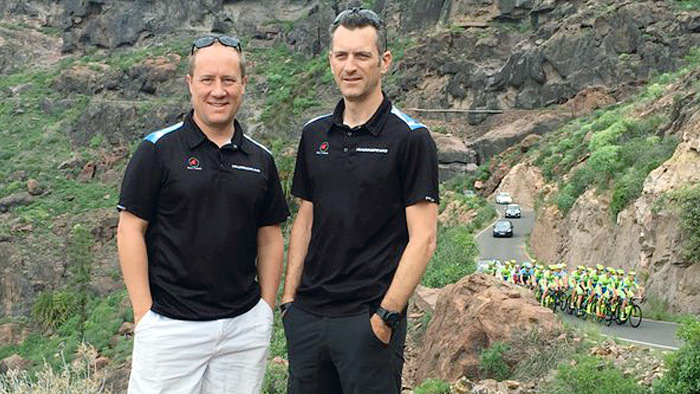 Each rider’s year long training program is overseen by one of the team coaches or director sportifs. All directors and coaches have a TrainingPeaks Coach Edition account, which allows them to view the accounts of the riders they are responsible for. In addition, the team’s head coach Guiseppe Toni, better known as ‘Pino’, has access to every rider’s TrainingPeaks Athlete Edition account in order to access the training programs and advise the directors. The training schedule during the December training camp is typically three days of endurance riding followed by a day of rest. Besides general endurance rides, the team will also do structured training which includes low cadence strength intervals, medium (sub threshold) intervals, and top-end speed work. Twenty minute climbing tests are also scheduled to collect and quantify current fitness levels. Rest days are often times loose affairs where each rider can ride on their own and leave whenever they wish to. Training sessions are personally monitored by the coaches and director sportifs that travel along in cars and sometimes on scooters. The riders don’t have to pack extra clothes and water in their jersey pockets since anything they need is close at hand in the cars. Each rider has an SRM power meter on their Specialized road bike in order to record what their training load from that day’s workout. The ride data is uploaded to TrainingPeaks by the rider after each training session and the data is used to help monitor intensity levels during intervals. Here’s a training file from Rafal Majka where he did a general endurance ride. After the ride, the riders sit down to lunch around 3:00PM. This may seem late, but it is understandable when the riders do four to six hour training rides starting at 10:00AM. Lunch consists of a large salad bar in addition to the main items which rotate through a selection of chicken, fish, rice, a large selection of fruits and vegetables. Afternoons are packed with meetings, testing sessions, massages, and nap time. Each rider is run through a lactate threshold test conducted by Pino, which are used to create training zones and set a fitness benchmark. Bike fits are also conducted on each rider and managed by the experts at Retul and Specialized. Meetings are also frequently conducted in the afternoons and consist of everything from discussing the upcoming season race program, training analysis, sponsor updates, equipment checks, photos, and interviews. Dinner is more or less the same as lunch with a large selection of items. Meats on offer rotate between roast beef, steak, pork, chicken and fish. Again, traditional high-carb pasta meals are a thing of the past as riders are encouraged to eat nutrient dense foods and just the right amount of macronutrients. Desserts are light and are typically fruit, yogurt, and a delicious Spanish rice pudding (known as arroz con lecha). Alcohol is rarely ever consumed by the riders except for special occasions where a glass of local wine may be enjoyed. As the riders retire to bed after dinner the night is just beginning for the staff as meetings are scheduled late into the night to plan the next day’s training and logistics.